* Really, the middle. If you get out a map, you can (more or less) draw a circle through Boston, New York, Philadelphia, Washington DC, Toronto and Montreal with its center at Ithaca -- equidistant from all somewheres in the northeast. How Widespread is the Scientific Support for Intelligent Design? I'm writing this up myself, rather than simply forwarding a link or two, because no one site said quite what I wanted to say in response. In particular, most of the links I found were either overly snarky for my purposes, or even openly contemptuous of people who hold the ID view. Of course there's nothing wrong with expressing one's opinion through humor, nor with expressing them strongly; but these seemed to me to be poor ways to convince a (presumptively) honest holder of the other view. Further, a lot of links were focused on the issue of whether or not to teach ID in schools (the political context in which it usually comes up), rather than on the issue of whether or not it's true. So I decided to gather what I'd found and put it forward. I strongly encourage additional links -- particularly to short articles accessible to non-scientists -- if anyone has 'em. And I also welcome correction on any factual errors I may have made (since I'm not a biologist there are bound to be some). The centerpiece of FH's claim was the notion that an increasing number of scientists (and he implied, although he didn't say outright, that it was a large number of scientists) were retreating from the theory of evolution and increasingly open to the theory of intelligent design. This was the basis of his claim that this issue was an easy win for conservatives (by which he meant ID supporters), since the facts went his way. He added some further specifics, dropping the names Michael Behe and Philip Johnson, and talking a bit about gradualism versus punctuated equilibrium (although he didn't use the latter term), but the basic, central point was that more and more scientists were accepting ID. I'm afraid that this simply isn't true. Think what you like about the issue, the fact of the matter is that ID is not gaining much ground at all; that the overwhelming -- overwhelming -- majority of all scientists, particularly biologists -- accept the theory of evolution. I would also claim that they do so on good grounds, but set that aside for now; first I simply want to focus on the claim that the scientific community, or any subset of it (e.g. microbiologists, who FH mentioned in his letter), is trending against evolution. Because the claim is false. Dozens of scientific and scholarly organizations have released statements emphasizing the centrality of evolution to contemporary science (usually in explicit reaction to ID claims). Many individual biology departments in states in which ID has become politically controversial have done the same. Of particular note in the previous link is the first item, that the biology department of Baylor University -- described by Wikipedia as "the largest Baptist university in the world by enrollment" -- has unanimously disavowed ID. Before discussing Defendants' claims about evolution, we initially note that an overwhelming number of scientists, as reflected by every scientific association that has spoken on the matter, have rejected the ID proponents' challenge to evolution. Moreover, Plaintiffs' expert in biology, Dr. Miller, a widely-recognized biology professor at Brown University who has written university-level and high- school biology textbooks used prominently throughout the nation, provided unrebutted testimony that evolution, including common descent and natural selection, is "overwhelmingly accepted" by the scientific community and that every major scientific association agrees. (1:94-100 (Miller)). As the court in Selman explained, "evolution is more than a theory of origin in the context of science. To the contrary, evolution is the dominant scientific theory of origin accepted by the majority of scientists." Project Steve is too snarky to really count here, but since it's so often mentioned in this context I'll say briefly what it is: in response to the Discovery Institute's lists of scientists (most of whom are not biologists -- indeed, many are only loosely describable as being scientists at all), a list of people affirming the truth of evolution as the foundation of modern biology, and disavowing ID (or other forms of creationism), has been drawn up, limiting itself to people named Steve (or Stephen, or Stephanie, etc.). The point -- again, snarkily made, but no less valid for that -- is that it's easy to get a far larger group of scientists who recognize evolution's truth than a parallel group of those who doubt it, even arbitrarily limiting the scientists to (they estimate) 1% of the whole. evidence for, and understanding of, evolution. The argument I'm making is not new; in fact, you can find it all over the place. For all that I felt like, in response to the specific nature of a specific set of claims (that I can't share with you for reasons already given), I wanted to sketch out my own reply, the underlying claim here has been answered many times before. Here are some of other people's refutations of the idea that scientists are increasingly doubting evolution: a brief version at the talk-origins archive; a version from the National Center for Science education; and a longer (and excellent) version by Marc Vuletic. Actually, the claim that science is just on the cusp of abandoning evolution is not new either. As this survey shows, creationists have been making this claim for centuries (since before Darwin's theory, including arguments about the age of the earth and common descent). It's always been wrong before; it's wrong now -- the product of wishful thinking and not the facts. If someone says the contrary, they're misleading themselves, or you, or both. If you want to disbelieve evolution, do so fully cognizant of the fact that the scientific community does not agree with you and is not coming to agree with you; and that it's findings all point the other way. FH, as I said, went on to make some specific points in his letter; but those were basically framed as his explanation as to why science was moving away from evolution. As I have tried to show, the premise is incorrect. But I will also try to provide some links to deal with the specific claims (e.g. the work of Michael Behe) in a forthcoming post. [Her campaign tactics] reflect a certain set of beliefs about politics -- specifically that more militarism is always better -- which happen to be the exact same set of beliefs that helped drive so many Democratic elected officials to duck and cover during the initial drive for war. To get the foreign policy right, you need on some level to have someone willing to challenge the hawkish political box. Clinton isn't just failing to do that, she's going way out of her way to re-enforce it. An awful lot of liberals I know seem unduly confident that when their favored candidate is elected President of the United States, he or she will withdraw American troops from Iraq. I think people should pay attention to Progressive Policy Institute chief Will Marshall when he notes that the major candidates at least sometimes seem to more-or-less agree with his case for indefinitely extending the US military occupation of Iraq... Marshall/CNAS seem to me to be broadly reflective of the Democratic foreign policy establishment types who continue to be very influential, especially with Clinton. Read the rest. It's an important issue. All of the major Democratic candidates here are lacking; but the one most likely to be bad on this is the most hawkish one, the one who sees hawkishness as essential politics. Second Update: More on this latter topic at TomDispatch. This is a crucial issue: the major Democratic candidates are not planning a full withdrawal from Iraq. Bad as Clinton is, Obama and Edwards aren't much better. The few candidates who support a genuine end to the war -- Kucinich and Richardson -- aren't gaining any traction in the polls. I think Chernus is right in saying that the issue here is that the major Dems are fudging the issue to appeal to a strongly anti-war base (and country) while still reassuring the foreign policy/DC establishment that thinks that of course we need to maintain some control in Iraq. But how can we possibly get them to support what the overwhelming majority of the country supports -- a full, genuine end to the war? I confess some difficulty here in becoming particularly outraged over this latest theory [of Bush's unmitigated executive power]. There is nothing new here. As has long been known, this administration believes themselves to reside above and beyond the reach of the law. What else would they need to do in order to make that as clear as can be? They got caught red-handed committing multiple felonies -- by eavesdropping on Americans in precisely the way the law we enacted 30 years ago prohibited -- and they not only admitted it, but vowed to continue to break our laws, and asserted the right to do so. And nothing happened. This latest assertion of power -- to literally block U.S. Attorneys from prosecuting executive branch employees -- is but another reflection of the lawlessness prevailing in our country, not a new revelation. We know the administration breaks laws with impunity and believes it can. That is no longer in question. The only real question is what, if anything, we are willing to do about that. More on the specifics that brought Glenn to this point in his original post (warning, Salon post: you'll have to watch a brief add to see it (but it's worth it)), and in the news article that inspired it. More on this topic from me in "Too many crimes for even impeachment to suffice". More recent Glenn Greenwaldy goodness here and here. Update: For more practical follow-up on Bush's latest power-grab, head on over to Kevin's place & follow the links. America is a family that's been living with a bunch of reckless, unchecked power addicts for the past 35 years. They've bankrupted us, trashed the house, taken a toll on our mental and physical health, abused the kids, run the car into the ditch, and pissed off the neighbors so thoroughly that some of them won't even talk to us any more. Like all addicts, they refuse to acknowledge anything they've done -- let alone accept any responsibility for it. And every time we say, "Hey, no problem. Let's just forget about it and move on as a family," they figure they've gotten away with it again. Read the rest. No, seriously: read the rest. • On a related (but not, I think, identical) note, Rick Perlstein -- whose blog, The Big Con, is climbing its way up my must-read list towards the "daily" slot -- hits the key political point of the next year or two: "Goldwaterism isn't the solution to our problems. Goldwaterism is the problem.". We simply must connect the dots in order to get out from the disaster we're in. Rick's discussion starts here, and then continues here (quote from the latter.) See also Digby's follow-up to Rick's first post. • Two things that should be done, and done now: subpoena Cheney (via); and make them actually perform their filibusters. Update: Looks like the latter will happen. (But why only one night? They should do it until the war ! @#$% ends.) On to subpoenaing Cheney! Various answers in the thread here. • Sam Harris replies to his critics. As you can imagine, he is conciliatory and inclined to give ground. This is a story from the associated press (via). I have omitted the opening paragraph, in the interests of preserving dramatic tension and humor; otherwise, it is as written. It started about midnight on June 16 when a group of friends was finishing a dinner of marinated steaks and jumbo shrimp on the back patio of a District of Columbia home. That's when a hooded man slid through an open gate and pointed a handgun at the head of a 14-year-old girl. "Give me your money, or I'll start shooting," he said, according to D.C. police and witnesses. Everyone froze, including the girl's parents. Then one guest spoke. The girl's father, Michael Rabdau, 51, told the intruder to take the whole glass, and Rowan offered him the whole bottle. The story then turns even more bizarre. The man walked away a few moments later with the crystal wine glass in hand. Nothing was stolen, and no one was hurt. The original story has a few more paragraphs in which they call the police, etc. -- UK military spokesman Major Mike Shearer (via). My second review column is up at Broken Frontier; this week I review Israeli cartoonist Rutu Modan's marvelous debut graphic novel Exit Wounds. Take a look. "Happiness is the Exercise of Vital Powers, Along Lines of Excellence, in a Life Affording Them Scope"
A wonderful sentiment. But who said it? It seems to have been popularized by the television show Babylon 5, which used "The Exercise of Vital Powers" as the title of one of its fourth season episodes (written by creator & executive producer J. Michael Straczynski, who has gone on to get a reputation as a writer of terrible Marvel comics). In that episode one of the characters says that the "ancient Greeks" defined happiness as "the exercise of vital powers, along lines of excellence, in a life affording them scope". It is most often attributed to Aristotle -- sometimes specifically to the Nicomachean Ethics. But while Aristotle says arguably similar things, he doesn't quite say that. So who did say it first? The answer was uncovered by the researches of Jeffq at Wikipedia (upon which most of this post is based). Jeffq tried to track down the quote in reference to the B5 episode. He noted that the phrase has become popularized in commencement addresses and the like, often cited to Aristotle... but that all of these seem to post-date the B5 episode. Whoever said it, it's a nice phrase. But until an earlier source appears, it looks like Edith Hamilton, not Aristotle, deserves the credit for this one. * In a later internet posting, JMS rather unhelpfully said (scroll down) that "It's not so much a quote as the Greek definition of happiness." This rather thoroughly begs the question, since definitions don't write themselves: even if you want to argue that the definition was implicit in an entire culture's view of happiness (which does seem to be what Hamilton is saying, see above), someone needed to be the first to use that phrasing. So of course it's a quote, even if the source of the quote intends it as a definition. 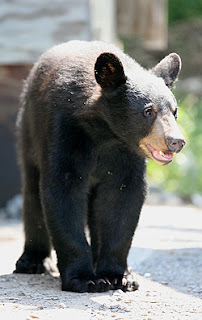 "At this point, they believe it is unlikely that anyone will encounter a bear on campus"
That's from this report from Hobart and William Smith Colleges, where I taught last year, about the fact that "a North American Black Bear cub weighing about 125 pounds and was spotted in the woods behind the pole barn on St. Clair (behind the first-year parking lot)." Hobart and William Smith Colleges staff photographer Kevin Colton [said]... "It wasn't like you had this vicious animal coming out from behind with the teeth and claws. He climbed in the dumpster, had some pizza and left." Nixon fell because his behaviour was inarguably criminal, and worse, petty criminal. And he had it all on tape. Bush's behaviour is not inarguably criminal. This is wrong on several levels. Of course some people would say that Nixon's criminality was evident long before that -- and they'd be right; but they'd also be the very same people that currently see that Bush's criminality is evident. Whereas the people who currently deny the obvious evidence of Bush's criminality are the very same people who needed that final tape to admit Nixon's (the very same people not only ideologically speaking, i.e. liberals, but often literally the same individuals). Second, Bush has done a great many things that are inarguably criminal. Not inarguably in the sense that no one will argue it -- as I have just noted, this was never reached for Nixon, and is never reached in many criminal trials, as various people mumble about conspiracies or repeat nonsensical legal arguments or cite imagined facts -- but inarguably in the sense that the arguments for it are terrible, believed by partisans for partisan reasons rather than out of any sense of respect for fact or reason or argument or evidence. (1) Breaking FISA -- this he's admitted. It's a flatly criminal act. (2) Endorsing and authorizing torture, in violation of the Geneva conventions, which are the law of the U.S. (since they are a duly-ratified treaty). This is in fact a war crime. (3) Disappearing prisoners, keeping them in secret prisons off the books; ditto. (4) Holding citizens without charge or trial or access to council. That's all just off the top of my head. Then there are the signing statements -- I don't know the specifics, but given that he's declared he won't enforce the laws he signs, and that he has (I believe) followed through on this in many cases, then that's a whole lot of inarguably criminal acts to add to the above list. And that's just the stuff I remember out of the stuff we know about -- almost certainly a tiny fraction of the whole, given the secrecy and habitual criminality of this administration. Even aside from Iraq, even aside from his criminally (morally if not legally) negligent treatment of New Orleans after Katrina, even aside from the almost uncountable horrific deeds he has done... Bush has done far more things that are, by any consistent standard, inarguably criminal than Nixon was known to have done at the time impeachment proceedings started against him. The one thing that Galt gets right here is that Nixon's crimes were petty criminal -- or at least could be easily made to seem so. As many others have pointed out, the guardians of our national political discourse (such as it is) are far more eager to prosecute and condemn petty crimes than serious ones -- for a variety of reasons, but especially because petty crimes tend to be very individual, whereas serious crimes tend to implicate large numbers of people and to be endorsed (to various degrees) by whole political parties, which makes those who dislike debate nervous. So there is some truth to this -- although honestly the only ones who thought that Nixon's crimes were petty at the times are those who similarly think that torture, brazen defiance of laws and the arbitrary arrest of citizens are petty too. Galt is talking largely about the political implications of impeachment of course, such as the fact that the mess impeachment would cause would give rise to negative feelings which "will almost certainly be laid at the Democratic Party's door " (she doesn't add: by our corrupt and debased media, with their usual ignorance of truth in the service of balance and the worship of raw power). And she may or may not be right about that -- I don't want to get into the debate about the politics of impeachment right now. But the debate needs to be placed in an accurate context: even aside from his lies about Iraq, Bush has done far more clearly impeachable things than Nixon was shown to have done. He has openly, brazenly and in some cases admittedly broken the law on numerous occasions. Whether the political scene demands that he escape unpunished or not, we should be very clear about what he is not being punished for -- about the scale of the crimes that we know about, and the virtual certainty that even they are dwarfed by many that we don't know about. Bush is a criminal; Bush has openly defied many laws; Bush is a war criminal. Regardless of what we choose to do with them, these are facts. We need to see them as such. This post is a result of my rereading Madden's 99 Ways to Tell a Story for my recent review. The list could obviously be extended far beyond the symmetry-pleasing 9 -- that's part of why it's such a good book. 1. The final panel in the "Upstairs" variation, in which Jessica's moody silence and staring-off-into-space posture services to replace the "What the hell was I looking for anyway?" thought balloon from the template. 3. The upside-down speech balloon in panel four of the "Underground Comix" variation. 4. All the details in the final panel of the "High Noon" variation-- the hidden gunmen out to get him, and the dangling watch unveiling the plot of the whole page: that the sheriff mistakenly thought it was high noon, but that it was actually 1:15 (hence the upstairs woman's "hee hee") and therefore was trapped. 5. The shoe on the oven in the "Opposites" variation -- reversing the hat on the refrigerator. 6. Madden's flowing hair in the "inking outside the box" variation. 8. The thematically apt pauses in the "Calligram" variation: "You interrupt me en//route wanting to know how//long you have been//procrastinating", with the shape recapitulating the events. 9. The saga of the one-eyed space-alien magnet. This is most clearly visible in the "Things are Queer (after Duane Michals)" variation, where you actually (for good structural reasons) get a good look at it in panel two (which is why I first noticed it). But yes, it's actually visible on the fridge in panel four of the template, as well as in many others -- though the only way to be sure it's the same is to look at the "Maximalist" variation, where it is visible not only in panel four but in panel six as well -- recognizably the same thing as from the "Things are Queer" variation. Interestingly, although the setting for panel four of the "Plan 99 From Outer Space" variation is largely unchanged, it looks to me like the magnet is drawn just a bit more clearly in that one (or am I imagining it?). Finally, the magnet (along with the others) are moved in "What's Wrong With This Comic", for one of the promised two changes in panel four. 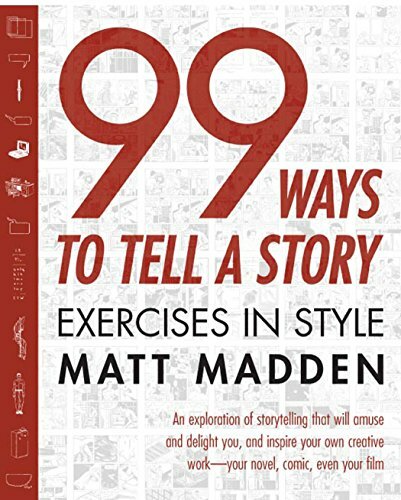 And, lo and behold, my first column -- a review of Matt Madden's wonderful book 99 Ways to Tell a Story, is now up at Broken Frontier. I invite you all, Noble Readers, to go take a look at it. Those who have been reading Attempts for a while may recall that I've actually written about Madden's book before -- although that, too, was not quite a straight review, so I was happy to take another crack at it. And I'll admit that there was a comfort zone in writing about a book I'd discussed once before (in another context) for my first column. Anyway, my reviews will -- FSM willing -- generally be up on Fridays. I'll try to post links to them here, but of course you can go read them at Broken Frontier yourself. As a small additional treat for my readers here, I'll mention one thing I didn't put in the review. My only negative comment on Madden's extraordinary work (which you can sample online here, by the way) is that the cover and general sales presentation of the book was terribly off-putting. So what would a good cover for Madden's book be? Actually, most of the foreign editions had quite good covers. I thought that the UK cover was clearly the best, and the nearly-identical Italian cover is (obviously) really good too. 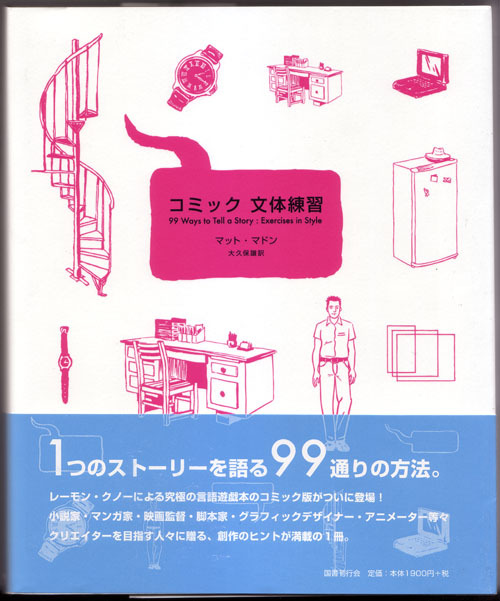 But the Japanese, French and Spanish covers are good too (they're all variations on this page). Only the US version was bad. Anyway, take a look at the column, and look for it on future Fridays! A Prince, whose character is thus marked by every act which may define a Tyrant, is unfit to be the ruler of a free people." Happy fourth, everbody. Let's remember what today celebrates. This began as a comment at Making Light, but got long enough that I decided to cross-post it here. It's in reaction to a question that Jim Macdonald asked about Bush's obstruction of justice (via) today: "Can we impeach the stupid SOB now?" At this point I feel that there are so many things that Bush *needs* to be impeached for -- not needs in the sense that it'd be good to have him gone, or needs in the sense that they are clearly, unmistakably impeachable offenses, but needs in the sense that Bush's getting away with this will do grievous, probably permanent harm to the republic -- that I feel like impeaching him once would not even be sufficient. Whatever we impeached him on, it would imply that the many other crimes -- high crimes, the highest of crimes, crimes against our beloved country (not to mention so many others) -- he was skating on. How could we not impeach him for the signing statements, by which he has openly announced his intention to wantonly disregard the very laws he was signing, attacking the very structure of our constitution? How could we could we not impeach him for his admitted spying on American citizens in direct violation of FISA and the fourth amendment (the extent of which remains wholly unknown, although it is likely to be not simply for security, since those would have clearly been approved by the FISA court)? How can we not impeach him for sanctioning torture, in direct violation of American law, the Geneva conventions, and the basic principles of morality? How can we not impeach him for imprisoning American citizens without trial, in defiance of habeas corpus -- indefinitely? How can we not impeach him for running secret prisons around the world, sending prisoners off to be tortured in other countries, picking up random civilians (many picked out randomly by bounty hunters) and holding them indefinitely in Guantanamo Bay? And how can we not impeach him for waging an aggressive war based on false claims -- a war that has left hundreds of thousands of Iraqis dead, not to mention thousands of Americans -- a war that is surely, finally, the greatest of his many crimes? Not to mention whatever secret crimes this most secretive administration has committed without public knowledge. Obstruction of justice? Of course. Nixon was going to be impeached for it; Bush should be too. But it's not enough. It leaves to many crimes -- high crimes, the highest -- unanswered. That they were committed wounds the republic. To leave them unpunished would wound it permanently. But how unlikely is it that he will be impeached even once? And even if a miracle occurs and he is -- it would not be enough. It could not be enough. Not enough to restore our country to us. At this point, I don't know what would. Or if anything can. According to the Dictionary of Video Game Theory, an "exploit" is... "a case where a player knowingly uses a flaw in a game to gain an unfair advantage". [T]he Cheney Administration has discovered... the "exploit" within the United States Government. As I watched Congressmen and Senators stumble and fumble and thrash, unable to bring to heel men and women who were plainly lying to them under oath, unable to eject from public office toadies of a boot-licking expertise unseen since Versailles, it struck me. The sheer, simple elegance of it. The "exploit". ...and I'll leave it on that cliff-hanger, in hopes that people go read it. Update 2: Predictions Past and Future. Jeff Lomonaco explained why Bush commuted rather than pardoned Libby... two weeks ago. In that spirit, I'll take under consideration Jonathan Zasloff's questions "Will Bush pardon Cheney before leaving office in January 2009?" and "Will Bush pardon Cheney in January 2009, then resign and be pardoned by newly-sworn-in President Cheney the next day? ", and suggest that what will happen is bigger than the first and simpler than the second: I predict that between November, 2008 and January 20, 2009, Bush will issue a general pardon for all employees of his administration who committed or may have committed crimes "in the course of their official duties" or some such smeg. A get-out-of-jail free card for the whole crooked lot of them. What? You think they wouldn't dare? You're forgetting the exploit. And the fact that these sociopaths will do, and dare, anything. Update 3: Glenn Greenwald has a good summary of the context here. And Avedon Carol has a post which, in its final paragraphs, discusses Obama's reaction -- and captures something I find essentially lacking in him as a candidate at this moment in history. Obama's probably my first choice at this point -- but as a candidate and potential President he has some very serious deficits, of which Carol puts her finger on one, using the Libby situation as an example. The Senate should limit itself to qualifications...at exactly the same that Presidents start picking nominees at random from a list of well-qualified ABA judges. Otherwise, it's entirely reasonable for the President to consider ideology, and it's entirely reasonable for the Senate to consider ideology. A President is due considerable ideological deference on cabinet appointments, but not on lifetime appointments to a third branch of government. If you disagree with Alito's legal views, you should oppose his confirmation by the Senate. And if you think that because Alito went through the Senate the GOP will give the next Democratic unlimited deference to choose a qualified justice I hope you'll let me guard that new shipment of i-Phones for you. Given that he was the one person who could possibly have stopped the fiasco, the amount of credit Powell deserves for ex post facto criticisms of the war is "absolutely none." Putting some misguided conception of "loyalty" to crackpot incompetents over the interests of one's country is worthy of no respect whatsoever. Even if Iran is supporting insurgents, I cannot visualize a military campaign that would, at reasonable cost, prevent Iran from engaging in that behavior. In other words, attacking Iran is stupid whether or not Iran is aiding Iraqi insurgents. ... An attack on [Iran] is too stupid of an idea to allow it to hinge on the empirical question of whether or not Iran is interfering in Iraq. The chemical weapons fiasco has led to a substantial misunderstanding of the argument about the case for invading Iraq. While the allegations about chemical weapons formed the center of the administration's case for war, the real problem is not that the administration was lying (although it was), but rather that Iraqi WMD, even if they existed, did not furnish a plausible reason for war. It doesn't excuse the administration to say that its sin was two-fold; on the one hand, it lied about the existence of WMD, and on the other it lied about the implications of WMD. Even if the United States had found a rump WMD program, it would not have justified the war, and I doubt very much that it would have affected the course of the insurgency. Like an attack on Iran for supporting Iraqi insurgents, invading Iraq for having WMD was stupid on its own merits. I don't know whether I agree with Robert or Glenn about Michael Gordon, though. I don't know enough. Given the NYT's past sins on Iraq, however, my uninformed instinct is to side with Glenn, not LGM's Robert. * The original reads "Iraq" where I have "[Iran]", but in context it's clearly a typo. ** It was also immoral, but that's another matter. Despite the unprecedented crimes of King George IV, no one will ever pay. In an aristocracy, such as the U.S., imperial courtiers never do jail time.